Sushi is my weakness. And, it just so happens that it seems to be my wife’s, too. So, we found ourselves here for a quick lunch set mid-week a little while back. Conveniently located just near the YongKang Street and ShiDa area. Whilst you don’t absolutely 100% need a reservation, it could help. As it was quite busy for lunch. Bar seating it, in my opinion, how all sushi experiences should go. It’s so much more interesting watching the dishes being prepared and put together. Even nicer to just point to a fish you’d like to try and say “that one” 那個 nà ge. I claim to make a half decent egg roll pancake. But not on the scale of this one. It looks legit, and tastes delicious! The sushi chef is busy at work with the shrimp. Sweet in flavour, the shrimp just melts in your mouth with the slight saltiness of the paste on top. Happy days. He then moves onto the Yellowtail, portioning it up for putting it together later. Ball of rice meets dab of wasabi paste, then the fish is molded around. Press to secure, then it hits the plate. Next stop – my mouth! But because he’s fancy, he has to get dressed up, first. First with some roe, then with spring onion. Almost too good to eat…almost. One of my favourites of the set. Very good flavours. Now he moves onto the Horse Mackerel. The skin is first scored with the knife (let me tell you, that knife is razor sharp. He barely had to press down to score the skin so effortlessly). A quick sear with the blowtorch. In my mouth, number 3. Solid freshness to the fish, good texture to the crispy skin, and overall a nice piece of nigiri. I could barely draw for breath before he had rolled up a ball of rice in this seaweed, and then spooned on top half avocado mix and half tuna mix, further lavishly sprinkling with green onion. Yeahhh. Oh, they also came around with an addition of some seared halibut for everyone. Some more searing going on here. This time I am not sure of the fish (sorry, I was too busy drooling to listen). Sprinkled with a bit of salt, this was dynamite. I’d say this looks like a cut of tuna, right here. It looks delicious, anyway, gimme! Simply cut and molded over rice with a bit of daikon radish paste and doused in a soy sauce. Squid is up now, and flame torched to release the flavours. Rolled up in seaweed, a tiny piece of torched fish roe is put on top with more green onions. Then, some delicious eel is flame torched and the whole restaurant erupts with aromas that I just wish I could eat. A dab of roe on top, a splash of soy sauce and then it’s on the plate. Egg roll is made by heating up a thin layer of whisked egg with some sugar, rolled up, and repeated as many times as deemed necessary. Then pressed into a rectangle and left to cool, it is then cut and served just like this. Whilst it sounds simple, it isn’t. But it is very tasty. A nice bowl of miso to wash it all down – delicious. The other set is a mixed set, consisting of 4 pieces of nigiri: The shrimp, yellowtail, eel and tuna, then this bowl of deliciousness in the pic below. Chirashi ちらし寿司 is a type of sushi bowl where lots of different pieces of fish are cut into small cubes and then presented over rice. I spotted tuna, roe, salmon and egg. This Chirashi bowl is probably the best I have eaten to date, and even had fish running through the rice, not only on the top! I tend to get greedy when it comes to sushi, and both uni and scallops are my weaknesses. 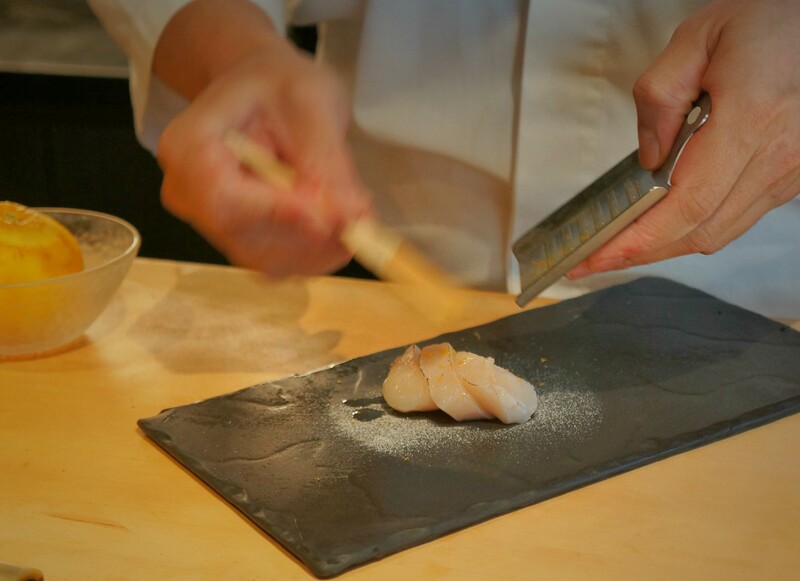 …dusted with yuzu shavings and rock salt shavings, then wedged between two chopsticks and, well, the rest is history. Oh, and we didn’t stop there – Uni. Japanese Uni from Hokkaido – win! Known as one of the best sources of uni in the world, Hokkaido churns out some insaaanely good Uni. As good as it was (and it really was delicious), I won’t be ordering this again, as it is just a bit too pricey for what it is.